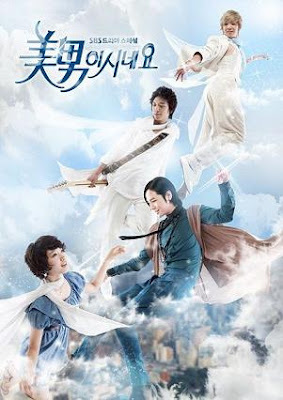 Recently I just watched You're Beautiful ( Mi Nam Isi-Nae-Yo -미남이시네요)... and it's absolutely addictive!! I keep listening to the OST on my laptop.. There have been many cross-dresser dramas in the past, but this one really takes the cake for 2009! It is a story of a girl, Go Mi Nyu who impersonates the place of her twin brother, Go Mi Nam, in joining a fictional idol band, A.N.Jell. The brother was unable to return in time to make his debut due to a botched eye surgery. However with one incident after another, as Mi Nyu displays her kindness and concern, it soon breaks down Tae Gyung's prickly ways, as they both get to know each other..
Other cast members include band idol Lee Hong Ki (from the band F.T Island) as Jeremy, and Lee Yong Hwa (from C.N. Blue). Why I recommend this drama? Solid acting and performance from all the actors. A balance of humour, romance, and good story line. Not to mention good chemistry between the entire cast! Also do remember to keep the tissue box handy! Don't forget about the soundtrack, as the songs performed by the band A.N.Jell are listen worthy, and absolute pure enjoyment and worth its gold in time. You're Beautiful OST Download Link. Hwang Tae Gyung: Lead singer of A.N. Jell. Actor- Jang Geun Seuk- also the previous ambassador for Etude House (before Lee Min Ho). He has done a number of commercials with Park Shin Hye in the past. He has been acting from a young age. Actress- Park Shin Hye- She is also the female ambassador for Etude House. For this drama, she had to cut her hair to look like a boy... Like Geun Seuk, she has been acting from her early years. Jeremy: Member of A.N. Jell. Kang Shin Woo: Member of A.N. Jell. Jung Yong Hwa- lead singer, and guitarist of the four member band C.N.Blue. UEE- one of the members of the girl group - After School. In real life, she has a shy personality.